"Like a magic box inside our physician marketing." Data, and the tools to mobilize it, are the marketer's most powerful equipment. CarePrecise Technology builds powerful tools for B2B marketing to healthcare providers. A central part of our business since 2007 has been to help the industry roll out quality products and services to physicians, clinics, hospitals, dentists, chiropractors and all the other types of HIPAA covered entities* to advance healthcare research, practice efficiency and administration. Whether you're marketing to physicians, hospitals or any of the hundreds of other HIPAA covered entities*, CarePrecise has the provider database, and the targeting and list preparation tools you've wanted in your B2B toolbox all along. What's Inside CarePrecise Platinum and Gold? Gathering healthcare provider prospect data from several sources, each month we put together an up-to-date, comprehensive database of all U.S. physicians, hospitals, and every other HIPAA covered entity: more than 5.8 million provider records, cross-matching data from the NPPES, The Centers for Medicare and Medicaid Services (CMS) maintains this database. All healthcare providers who are HIPAA covered entities must obtain a National Provider Identifier (NPI) by reporting their information via the NPPES, and updating it when it changes. This represents virtually all of U.S. physicians, hospitals, and other providers who accept insurance or are associated with a hospital. PECOS, The federal database containing information on healthcare providers who are eligible to bill Medicare. the LEIE List of Excluded Individuals/Entities (LEIE): The federal database maintained by the HHS Office of Inspector General containing information on providers who have been barred from billing Medicare due to fraud or controlled substance conviction, patient neglect or abuse, and other convictions and delinquencies. from the HHS Office of Inspector General, USPS, and the U.S. Department of Commerce to create the most complete database on healthcare providers available anywhere. We shape that data into CarePrecise Platinum and CarePrecise Gold – an open source Microsoft Access database with unlimited exports. Despite the large number of records and broad content, data is conformed and formatted for use on ordinary desktop and laptop computers, using ordinary office software such as Microsoft Access and FileMaker. CSV files are also included for import to virtually any software. CarePrecise Platinum offers deeper data on the providers, including physicians' practice groups, hospital affiliations, graduation year, school, and more. We wrap our powerful segmenting and targeting tools around the data, making it push-button simple to pull highly targeted direct mail, telemarketing and fax lists, based on provider specialty (including all of the physician specialties and subspecialties), geographic location (by zip code, state and/or geographic radius), gender, Medicare-eligibility, wealth, urban/rural status, and more. You can even pull the new physicians, and know when they registered. We build-in custom querying, the ability to save provider profiles for reuse and fine-tuning, and a powerful formatting and genderizing tool – SharpMail – that makes direct mail lists ready for our built-in label printing or export. It's critical that your direct marketing campaign is just as specialized as your doctors. The message that works for a family medicine physician may not get through to an otolaryngologist. Your product or service may be able to help physicians across a wide range of specialties, but explicitly telling a sports medicine doc that it works for sports medicine is more effective than a generic message. Your message may also benefit from geographic personalization. The needs of rural doctors and hospitals can be very different than those of suburban multi-physician practices. Have a hunch that your best prospect might be a practice that serves lower, middle or upper income patients? Test all three and compare. CarePrecise Gold makes it easy to split a list into wealth levels, and output a properly-cased mailing list for testing responses to a product landing page or reply card. Test urban and rural locations, distance from a city's center, state border areas, etc. to determine the most cost-effective segments. Then you can even overlay these to get the tightest and most effective targets possible for your marketing effort. Maximize profits: Sell to all market segments by crafting, testing and mobilizing the most effective message for each. Do you sell primarily to large group practices, or small, sole proprietors? 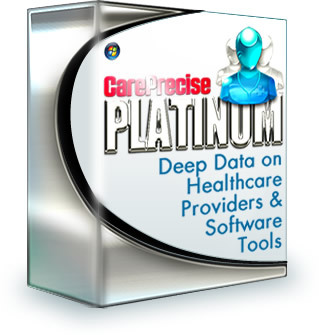 CarePrecise Platinum or CarePrecise Gold can help you target individuals or groups, and sort them by size. Draw upon your data resources to know who you're mailing and telemarketing to. Know the physician's specialties, gender, her patients' profiles, and if she's newly practicing. Use fresh addresses and phone numbers to connect on the first try. Your communications should drive a physician to information on your web site that is truly useful, and should offer to mail a hard copy, since physicians frequently prefer to carry papers than to sit at a keyboard. Physicians want authoritative, credible information about new products and services that may be helpful for their patients or practices. Clear, concise, high-quality information builds trust. Getting a name or credential wrong is a forgivable human error, but it doesn't engender credibility with anyone, and practitioners can be very sensitive about mistakes. CarePrecise data is updated monthly with constantly changing information reported by physicians themselves, as required by federal regulation. A single physician may control or influence several million dollars in healthcare purchases made annually by his patients. It's no wonder that they are deluged with marketing messages. Only those that offer real value will succeed. Gatekeepers between you and the doctor work hard to cut out wasted time and information overload, so a message that teaches or reminds a physician of something important will reach its target. Get your information past the gatekeepers by editing it down to the vital facts, and make the communication direct and professional. Generic-looking mailers with names and addresses in all capital letters, and a salutation like "DEAR DOCTOR" just won't make the cut. CarePrecise Gold with the SharpMail tool makes sure your written communications with physicians look smart and professional. Consider mailing information about your product that puts indicators and counterindicators for use right up front, so that physicians and their staff know that the information is important and to the point. Cut the sales pitch, or nest it inside, like this: "You should check multiple sources, to know things like whether a physician is enrolled in the PECOS system, or has been barred from billing Medicare. CarePrecise Gold combines all of these sources in a single tool." Especially for bigger invoices, building relationships with physicians and their key staff is essential. You need to know what communications have gone to which practice, and when. CarePrecise Platinum or CarePrecise Gold can help you keep track of lists used for specific communications, maintain an opt-out list for practices who require more delicate handling, and the ability to create and maintain separate marketing lists for different regional territories. Using rich demographics, you can match the right representative to each target – all without third-party CRM tools. They still work to generate leads, but some channels are better than others. Besides postal mail and email, a new channel is gaining wider acceptance. Direct mail is the old tried and true, email is cheap, but both end up in the trash -- some estimates are that fewer than 2% of emails to physician offices ever reach the eyes of the physician, and postal ad campaigns aren't much better. The new kid on the block is phone text messaging (SMS). But handle with care: text messaging is a strong penetrator, but is likely to be perceived as invasive. The "untouchable" physician isn't all that untouchable if you have her personal email or cell phone number, but if you decide to risk such a campaign, be sure to keep the message short and compelling, and include a shortened link to a landing page with the straight info on your product. Remember that perhaps a majority of recipients will view your attempt to sell them something on their phone as spam. There are SMS gateway services that make it simple to send bulk text messages; most have an anti-spam policy that requires you to have the recipient's opt-in before sending. CarePrecise data sets contain around 900,000 physician phone numbers (not to mention a similar count of fax numbers), but be aware that only a fraction of these are cell phones; some of the rest may be turned into voice mail messages by the recipient's phone carrier (your landing page link will essentially be lost), but a huge number will simply not go through. Whatever the technical issues, the real danger is damaging your relationships with existing physicians; you'll want to carefully groom the phone list to remove anyone you are already reaching through a "nicer" channel. Still, we're aware of companies who are already testing bulk SMS on physicians -- both opt-in and cold-call. SMS marketing is a growing channel, and is expected to grow wildly over a few years, but whether or not the benefits will out weigh the risks in marketing to physicians is an open question. The hardest part is reaching the right party. If your product or service is about billing and administration, it helps to reach an administrator. If you sell to ER departments, it helps to have the right address and phone for that. Some hospitals have as many as 30 different addresses, each related to a separate business unit or service type. Because CarePrecise data lets you pull records by facility and specialty codes, you'll be able to narrow your focus to the right people. 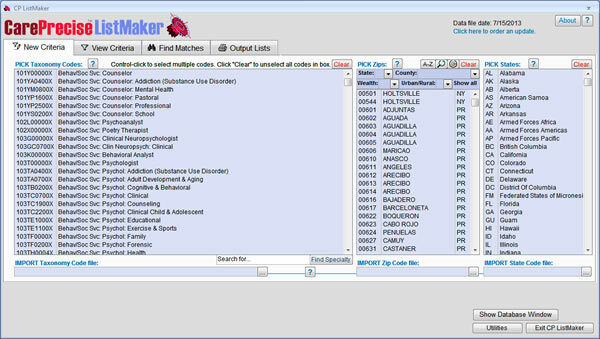 In the CarePrecise data, a single hospital will typically have many different units, each having its own record and contact name. Most facilities list two addresses phone numbers – one for the facility itself and one for the facility's official mailing address. The same goes for fax numbers. Having this depth of data makes reaching your target for more likely than generic hospital marketing lists. Hospitals have some different needs and interests, depending on service area demographics like poverty, urban center, and rural locations. For example, if you're selling telemedicine equipment, you need to know the distance between hospitals, and whether they're rural, urban or suburban. If you market transportation services, you'll want to see a list of facilities within a given geographic radius when you build a marketing plan. CarePrecise Gold helps you gather that intelligence. In a recent test, we learned that for a campaign involving obstetrics facilities, targeting the facility based on its code in CarePrecise Gold, and using the SharpMail tool to format addresses was 17 times as effective as using the hospital's main mailing address without SharpMail. One campaign to fewer than 100 hospitals paid for CarePrecise Platinum or CarePrecise Gold several times over. If you're marketing a product or service related to billing or administration, you'll be glad to know that CarePrecise Platinum or CarePrecise Gold give you an administrative contact, the individual authorized to edit the hospital's federal provider records. Some hospitals have only one or two records, and they group several units/facilities under a single record. Even then, CarePrecise lets you find specific types of facilities within the hospital, drawing on the multiple reported taxonomy codes. Our database of more than 5.8 million provider records is updated monthly, and is the most comprehensive and accurate healthcare provider data available anywhere, although similar data is available at many times the price. For details on the specific data fields included in CarePrecise healthcare data solutions, visit this link. The data is provided open source without restriction on the number of uses or exported records by the license holder. See our liberal End User License Agreement. * CarePrecise data includes all U.S. healthcare providers that are covered entities under HIPAA, which represents virtually the entire cohort of providers in most categories (physicians of all specialties and subspecialties, hospitals, dentists, nurses, clinics, labs, pharmacies, etc.). HIPAA covered entities are required by law to report the National Plan & Provider Enumeration System database to obtain a National Provider Identifier (NPI) number. Enumeration is required in order to bill Medicare, write prescriptions, file electronic health insurance claims, or be listed as a referring provider on any other provider's electronic health insurance claim, or who have an affiliation with a hospital or other entity that files insurance claims. No provider may opt-out of this database or its distribution, and all are required to update their information when it changes. There is also a strong economic incentive for providers to keep their data current, as these source databases and CarePrecise products are used throughout the healthcare industry to expedite claims processing and to assure proper reimbursements.